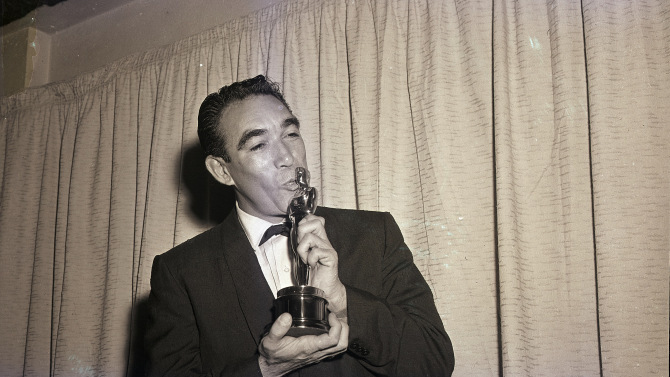 With diversity in Hollywood being such a hot topic — as it should be — and the Oscars around the corner, it seems like the perfect time to reflect on one of the most trailblazing Latinos in entertainment: Anthony Quinn. Born Antonio Rodolfo Quinn Oaxaca in Chihuahua, Mexico in 1915 and raised in poverty in Los Angeles, Quinn was the embodiment of the American Dream. 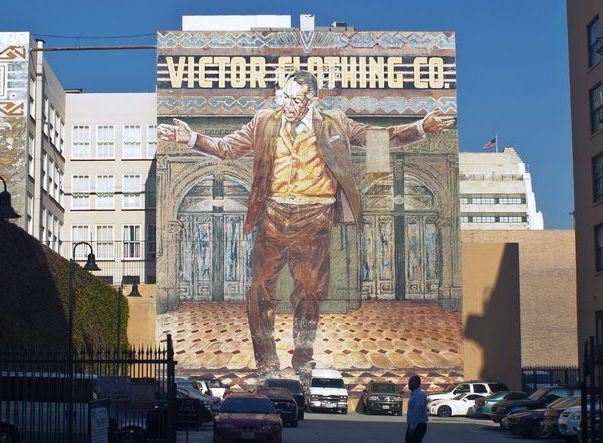 Though he eventually worked in almost 150 films and won two Oscars, the stage is where it all began, so it’s fitting that the landmark, 70-foot “Pope of Broadway” mural in downtown Los Angeles erected in 1985 in Quinn’s honor is undergoing a $150,000 restoration effort starting this month, with expected completion in 2016. It was on the streets of downtown LA that Quinn first showcased his gift as a young actor, performing at the Million Dollar Theatre. Making the initial leap from the stage to the screen didn’t happen overnight, though. Quinn played all sorts of ethnic roles in B-list movies before earning top-billing status. By 1947 he had appeared in over 50 films, playing everything from gangsters to tribesmen. Today, it’s hard to think of another actor who played that many characters of all races, religions, nationalities, and moral codes. Even when playing villains he imbued them with a certain complexity and sophistication that humanized them, as in Federico Fellini’s “La Strada” (1954). The film, about a woman who is sold to a traveling circus strongman, earned the first Academy Award ever handed out in the Best Foreign Language Film category. As a supporting actor, Quinn often stole scenes from right under the nose of better-known actors. Such was the case with “Viva Zapata!” in 1952, Quinn’s big break. That the leading role of the Mexican revolutionary wasn’t played by him was disappointing to Quinn (the director Elia Kazan insisted on Marlon Brando) but the following year, Quinn was rewarded with a Best Supporting Actor Oscar for his role as Emiliano Zapata’s brother Eufemio, making history as the first Mexican American actor to win an Academy Award. Brando was also nominated that year, but lost. Quinn went on to win another Oscar as Best Supporting Actor in 1957 for his role as the painter Paul Gauguin in the Van Gogh biopic “Lust for Life.” Some sixty years later, Mexican filmmakers Alfonso Cuarón and Alejandro González Iñárritu are leaving their own mark at the Oscars. Later in his career he’d return to the stage to play Stanley Kowalski role in “A Streetcar Named Desire” and again in the ’80s for a musical revival on Broadway of “Zorba the Greek” at the ripe age of 68, when most leading men’s careers fade out. Recognizing his legacy, the NCLR ALMA Awards give out the Anthony Quinn Award for Industry Excellence each year (Guillermo del Toro received the honor last year). When it came to his personal life, Quinn was far from traditional. He married three times and fathered 12 children. He died of pneumonia and respiratory failure in 2001, aged 86. Aside from being an accomplished actor, Quinn was also a sculptor and a painter, so it’s only right that his legacy is remembered through a towering mural, worthy of this Hollywood giant.